Right now, in October of an election year, many in Washington have already begun discussing what the next administration should aim to accomplish in its first 100 days in office. Such planning is critically important, of course. But as you have repeatedly stated, you intend to accomplish as much as is humanly possible in the fourth quarter of your final year in office. 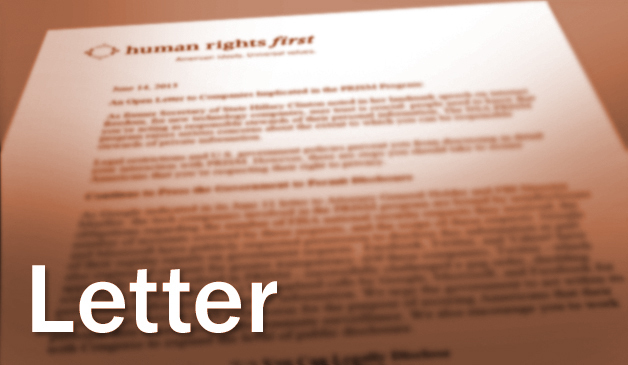 In that spirit, I am writing to suggest specific actions you can take during the last 100 days of your Administration that would go a long way toward securing your human rights legacy. Recognizing that, in today’s acrimonious political climate, you may not have a responsible partner in Congress for much of what you would like to accomplish, the actions proposed below are all squarely within your executive authority to implement. As you said last month in New York, today’s refugee crisis is one of the most urgent tests of our time. Unfortunately, instead of exhorting Americans to do our share to meet this challenge, too many politicians have engaged in fearmongering and demagoguery, aiming to turn legitimate concerns about security to partisan advantage. I know you share my belief that the American people are more welcoming and compassionate than our current public discourse would indicate. Continued leadership from your White House can illuminate that truth. Increase resettlement commitments. Given the urgency of the global crisis, I urge you to announce a further increase in the resettlement of refugees—including Syrians—to the United States. Leadership from the White House is needed on this issue since it has emerged as a central one in the presidential election debate. A less ambitious but still meaningful step would be to increase the number of refugees eligible for resettlement from Syria and the region, which is currently capped at 40,000. Launch a private sponsorship pilot program. Last month Assistant Secretary of State for Population, Refugees, and Migration Anne Richard expressed support for the launch of a pilot program that would allow Americans to sponsor refugees to come to the United States. I urge you to direct your team to move forward expeditiously with such a pilot program. Doing so would allow Americans who feel like Alex, the boy from Scarsdale whose eagerness to welcome a refugee into his home you shared with the participants at your Leaders’ Summit, to take such direct action to help refugees. End the detention of children and families. Your Administration agreed under the New York Declaration for Refugees and Migrants to work toward ending the detention of children. Healthcare professionals testify that even short-term detention harms them. The Department of Homeland Security (DHS) and U.S. Immigration and Customs Enforcement can use measures, such as community-based case management programs, when individuals need additional support to appear for their immigration appointments. Such programs are not only more effective and humane, they save taxpayer dollars. You could begin this policy change by releasing the families held at the detention facility in Berks, Pennsylvania. Allow asylum seekers to be seen by a judge. The U.S. asylum and immigration court systems are failing refugees. Chronic underfunding, hiring challenges, and shifting enforcement strategies have left the asylum office and the immigration courts in a state of crisis. More than 620,000 removal and asylum cases are pending, and many asylum seekers are waiting three to six years for resolution of their claims. The Executive Office for Immigration Review (EOIR) set a goal of placing 100 additional judges onto the bench this year. It has fallen short and grown by only 35 judges. I urge you, in your final 100 days in office, to direct EOIR to cut through bureaucratic inertia and meet its own 100 judge hiring goal. Release asylum seekers on parole. Refugees who request protection at U.S. airports and borders are often detained in jail-like facilities. Such automatic detention flies in the face of U.S. human rights and refugee protection commitments. In the first year of your Administration, DHS issued an Asylum Parole Directive confirming that an asylum seeker found to have credible fear of persecution should generally be paroled if her identity is sufficiently established and she does not pose a danger to the community or an unmanageable flight risk. This directive is not being uniformly complied with, and many asylum seekers are languishing in detention for months or longer. I urge you to direct DHS to: 1) issue written guidance requiring ICE offices to implement the 2009 Asylum Parole Directive, and 2) confirm that the directive remains in full force in the wake of the DHS 2014 Enforcement Priorities Memorandum. Though the press treated it as a gaffe for which he later apologized, Vice President Biden had a point when he said that, on Syria, our allies are our biggest problem. In fact, the human rights violations of our allies undermine American interests beyond our aims for a peaceful resolution to the Syrian civil war. A forceful statement from you to the states of the Gulf Cooperation Council indicating that our current relationship is unsustainable as long as they violate rights with impunity would send a signal that American tolerance for bad behavior is limited. You could back up such tough words with action by announcing visa bans on Bahraini officials credibly linked to human rights abuses or corruption, a step you could take under Presidential Proclamations 8697 and 7750, respectively. By our conduct today, the United States is creating the rules of the road that other nations will follow as all states confront the persistent threat of terrorism. You understand the damaging precedent that our use of indefinite detention at Guantanamo sets, and we have welcomed your repeated commitment to close the facility. I urge you to continue to take aggressive action to transfer, prosecute, and otherwise find dispositions for the remaining 61 detainees held there. You came into office with a clear understanding of the risks posed to our democracy by perpetual armed conflict and have taken steps to constrain war authorities consistent with international law. As you know, war authorities—such as those claimed under the 2001 Authorization for the Use of Military Force (AUMF)—can weaken the framework of human rights norms when they are used to justify indefinite detention, military trials, and targeted killings outside the battlefield. I urge you to take executive action—by means of Executive Order or policy directive—to bequeath to the next administration meaningful restrictions limiting these authorities to situations that clearly rise to the level of armed conflict. Finally, the escalating siege of Aleppo and the blatant atrocities being committed by Russia and the Assad regime demand renewed energy and leadership. I urge you to take steps to maximize the possibility for a political solution to the Syrian conflict. The Security Council has repeatedly passed resolutions calling for the protection of civilians. I urge you to consider action to support and enforce those resolutions and provide humanitarian aid. In particular, you should act to build on the Cessation of Hostilities Agreement painstakingly negotiated with Russia over many months and continue to press for its full implementation by all parties. Mr. President, you will leave office at a time when the need for American leadership to address a range of global crises is acute. While our country cannot solve these challenges alone, it is strongly in our national interest to advance the universal ideals of human rights. I urge you to leave no doubt that America stands for the bedrock premise of the Universal Declaration of Human Rights that our nation did so much, under Eleanor Roosevelt’s leadership, to craft: respect for human rights is the foundation of peace and security in the world.